We’re reviewing a double-dose of Kate Milford’s Aracana Project – two novellas set in the same world as her awesome full-length novels The Boneshaker and The Broken Lands. Yesterday (Part I) we reviewed The Kairos Mechanism; today we review Bluecrowne. Fan of The Boneshaker? This is for you. Fan of The Broken Lands? It’s for you, too. Liked The Kairos Mechanism best? For you, from me. Can’t wait for Greenglass House? Here, have this book. All yours. Wish The Left-Handed Fate was coming out tomorrow? I will gift wrap your copy of Bluecrowne, because it already has your name on it. The year is 1810, the place a sovereign port city called Nagspeake. A canny sulter, one Mr. Foulk Trigemine, is still in possession of his Kairos Mechanism and has set his sites on the city’s harbors. With the help of another powerful man named Blister, a chapman gifted with an keen understanding of chemistry and the ability to manipulate flames, Trigemine searches the harbor for a person possessing a great degree of power – someone who might not even know they possess such power, and someone whom Trigemine can persuade (by force, if need be) to become his master’s pet conflagrationeer. In the harbors below, unsuspecting twelve-year-old Lucy Bluethorne is heartbroken. The daughter of the captain of a ship bearing a Letter-of-Mark (not a privateer, mind you, but an authorized seafaring agent of the Crown), Lucy has lived her life on the sea, from the beaches of Java to the shores of England. But after a brush with violence, Lucy’s father decides to move his family to Nagspeake while he continues his work at sea. For Lucy, being grounded on the land is an unfathomable horror – her heart yearns for adventure, for the sea, to be with her family aboard The Left-Handed Fate. The only thing that will make Lucy’s new home bearable is the fact that she will live with her stepmother, the kindhearted and unfathomably powerful Madame Xiaoming, and her seven-year-old half-brother, the exuberant and generous Liao. Little does Lucy know that trouble is coming for her family, that her precocious brother possesses certain abilities that have drawn the attention of very hungry, very interested parties. It is up to Lucy – with a little help and a little luck – to save her family from enslavement and despair – if only she can find the strength and bravery within. Oh, Bluecrowne! I love Natalie Minks so much, and her adventures in Arcane, Missouri are still my favorites in this series, but Bluecrowne‘s Lucy and Liao give the brave young Natalie a run for her money. This novella precedes the events of The Kairos Mechanism (sir Trigemine still possesses the unique mechanism), but is part of the same whole – and has close connection to the events that happen much later in the 1877’s The Broken Lands. 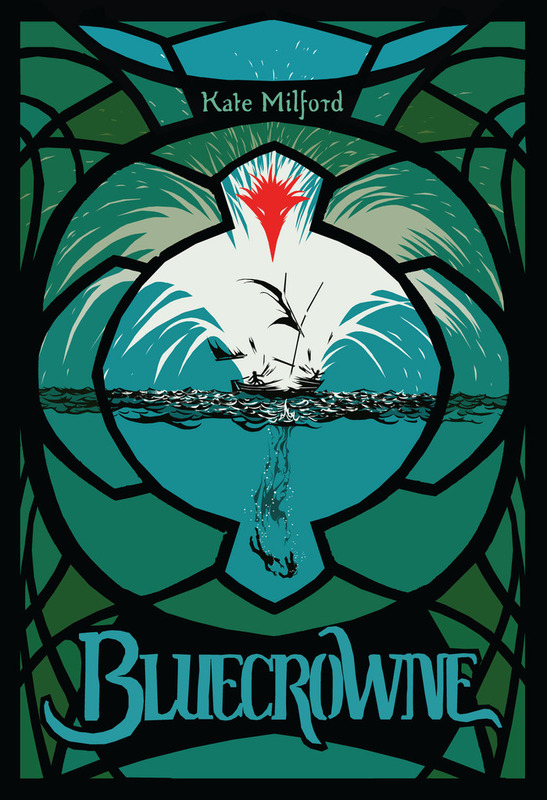 Unlike the other books in this world, Bluecrowne is unique in its raw emotional power; this particular story is a powerful tale of love between sister and brother, parent and child (even if they aren’t bound by blood, they are still family). It’s also the tale of a love between a girl and the sea, her passion to command her own ship, and her understanding of how to win battles at sea (a very important development at the end of the novella). I love Lucy Bluecrowne so much, not just because of her bravery or fierceness in the face of danger, but because of the love she shows for her family – even when there aren’t dramatic life or death stakes, Lucy’s care for her little brother and her admiration for her stepmother and father shines through. And that, dear friends, is an awesome thing to read (especially in a YA/MG landscape with so few loving, living relationships between family members). I also very much loved the intelligent and surprisingly wise young Liao – who might sound older than a seven-year-old, but who I believe in implicitly as a character. I love, love the fact that the Bluecrowne family is bi-racial, but wholly accepting and mostly accepted by others; I also love that while most of the lore in the Aracana series is of the Americana variety, there is Chinese folklore and magic in this particular story. Finally, what’s a story without a terrifying villain? In Bluecrowne, just as with every other book in this series, there’s a sense of building and foreboding – as I said in my review for The Kairos Mechanism yesterday, one of my favorite things about Milford’s Arcana books is how there’s this sense of building tension towards an inevitable showdown. This is very true for Bluecrowne – for as bad as Trigemine is, his master Mr. Morvengarde (you might remember him from The Kairos Mechanism) is far more terrifying. Worse, Morvengarde reports to an even more powerful and terrifying ultimate master – Jack Hellcoal himself. Jack, a soul so twisted that he was rejected from both Heaven and Hell, and who now walks the world searching to make a terrible home of his own. As with The Kairos Mechanism this is a story that can be read as a standalone, but you will love it even more if you have read The Broken Lands or The Kairos Mechanism first. Here danger is aplenty, and unlike any of the other tales in this series so far, there is also great sadness and loss. But this loss is tempered by love, and… well, you’ll see for yourself. I loved this story very, very much, and I am even more eager for The Lef-Handed Fate‘s next voyage. Kate Milford’s kickstarter campaign is in full force and closing in on its final week! You can contribute to the kickstarter campaign here if you’re interested in reading Lucy and Liao’s wonderful story. Should the campaign reach its goal, you’ll be able to purchase the book in paperback format, in standard ebook formats, and a special illustrated edition (similar to The Kairos Mechanism).